Arata Hinohara, in the place of the Amawakuni Arata, is captured and charged with the murder of the princess and sentenced to a prison island (along with Kotoha, the girl from Arata’s tribe) where random executions keep the populace there on edge. While there, he meets the wild prisoner Kanate and his little brother Ginchi. Kanate challenges Arata, believing that killing the boy will result in his freedom, but the two soon find a mutual respect for each other and Arata later steps in to save the boys when their fates are at their most dire. Afterwards, Arata “levels up” and the four escape the island just as Kannagi, the traitorous captain of the princess’s guard, arrives at the prison island to chase Arata. I don’t feel bad saying so much about this story because it’s both so easy to summarize and the story doesn’t break any molds of the genre aside from changing the set dressing. Also note – I didn’t mention the Arata currently on earth at all. He’s appeared in two scenes since the pilot – both in episode 2. Maybe the focus will shift soon? I don’t know. I get that other worlds are more interesting to Earthlings since this is where we live, but Amawakuni Arata seems to be adjusting too well a bit too fast. The themes of trust, both broken and earned, and promises, broken and kept, continue to show up, and their focus in the series is already starting to wear a little thin only four episodes in. Don’t be a jerk. Got it. Can we move on, please? In terms of plot devices, Kannagi is a terrible villain.He vows to kill Arata, but instead sends him off to the prison island with the intent to watch from afar, only to change his mind yet again when he decides to follow and slay Arata anyway. However, Arata keeps moving and is now going BACK to the capital, where he was takenafter being captured for conviction and sentencing. This is shaping up to be Keep Away: The Anime, and that gets boring really quickly. Also, this show suffers from one of my pet peeves – clunky exposition. The princess magically appears at one point and explains she’s not dead and that Arata is awesome. Arata “levels up” by touching a tainted Hayagami (sword/dagger) and thus we are transported to a magical flashback zone where he encounters his first opponent’s backstory in its simplistic entirety. A change of heart ensues and Arata’s Hayagami, already inhabited by a Kamui spirit of its own, is now doubly-possessed. At least we find out at the end of episode 4 what Arata’s Hayagami’s original Kamui controls. 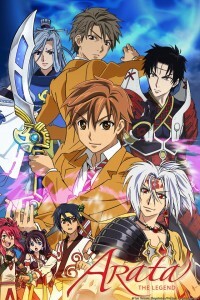 This is a pretty standard series, and if you happen to like shonen shows, then you’ll probably enjoy it. I generally don’t, however.